When I first began buying things online in the late 1990s, I was amazed at how much ‘old stock’ there was in the world. Prior to eBay, I hadn’t imagined that any unbuilt vintage R/C car kits from the 1980s (or earlier) still existed, let alone that anyone would be able to find them. Nearly 20 years later, the Internet is still a great source of vintage toy treasures. But inevitably the supply of unused ‘old stock’ out there, is in decline. And it’s only going to get harder to find things in the years ahead. Growing up in the 1980s, I remember looking through the one and only Tamiya catalogue I owned on many occasions. Actually I didn’t even own it. Another kid had loaned it to me and then forgotten to ask for it back. But so often I’d stare at the pages wishing there was a way for me to buy even one or two of the R/C cars that were featured. Wanting to own something, yet having nothing but a few photos of it, is a great motivator. By the mid-1990s, I still hadn’t entirely forgotten my childhood obsession with Tamiya. But by then, practically all of those early, evocative Tamiya vehicles that had been known to just about every schoolboy of the 80s had been phased out of production. My only chance of finding them was to look through local newspaper classifieds, or visit garage sales and markets, and hope to get lucky. But then the Internet arrived, and everything changed. The idea for this article was to talk briefly about what happened to vintage toy collecting once we all had access to the Internet, and to look at the past, present and future of buying vintage R/C items via the Internet. 1. 1999-2005 were boom years for vintage toy buying on the Internet. 2. Today, those boom days are long behind us. 3. Collecting will only become more difficult in the future. Sometime between the mid and late 1990s, most people discovered the Internet. And soon after, came the ability to buy things from around the world. The possibilities this opened up, particularly for finding rare things, were really incredible. To my amazement, quite a large amount of old toy and hobby shop stock had been lying dormant in other countries. Things like brand-new-in-packet spare parts, and even whole brand new R/C kits. I can still remember the first time I watched in amazement as a new in box, unbuilt Tamiya Sand Scorcher kit sold on eBay for about $800, sometime in the year 2000. At the time, the price seemed really high to me. Yet many collectibles were still finding their feet in terms of value and demand. It was merely the beginning of a huge wave of vintage toy trading. Anyone who was using eBay between the years 1999 and 2005, was a witness to the biggest, most interesting wave of vintage toy buying and selling we will ever see. eBay was an exciting online flea market. And what was happening was basically a once-in-history event. The Internet was colliding with a plentiful (but finite) supply of old leftover toy stock, particularly from the 1960s, 70s, 80s and 90s, which was being found all over the world and listed online. And it was all finding new buyers, and as a consequence, gaining “collectability” and value. Collectors went crazy buying up as much stuff as they could afford. As far as R/C collectors were concerned, I knew of one who bought over 30 examples of the same mint-in-box vintage R/C kit because he was so obsessed with it. I also know of some people who made quite a lot of money simply buying and selling items. I can also remember that practically every single vintage Tamiya R/C kit from the first 50 Tamiya models, was often available for sale on eBay at once. And priced for less than they are worth today. Personally I was lucky enough to buy a variety of things, including some cars and kits for around $50 that are now worth 10 times that amount. Other vintage unopened kits and models were, at times, available from 4 or 5 sellers at once. Of course, that boom couldn’t last forever. Once the bulk of those vintage goods being dug out of warehouse and attics, found their way online and into the hands of eager enthusiasts and collectors, things gradually began to ease down. And things have been slowing down ever since. We still see many vintage toy items traded today. But it’s nothing like the level it was in those early eBay years. Today what we see are, at best, a moderate number of “unused vintage stock” type items listed for sale at any one time. You might also see the occasional collector who decides to sell up. But it can often take years for certain rare pieces to come up for sale at all, where once they were quite commonplace. …just one of these items might sell for anything up to $130. And that’s if you can find one. A random selection of vintage R/C items collected over the years. So what will vintage R/C car collecting be like in the years to come? 2. Some of them are being bought and enjoyed by other people, every day. So if you love vintage R/C toys, and regardless whether you’re a serious collector, a casual buyer, or you’re just looking for one particular old car you used to have or always wanted, you should know that they are going to get harder to find over time. I’m sure most of us know this already. But it just pays to be aware of it. And not just in an anecdotal sense. Because I really think there is a statistically lower chance of finding the rare things you are looking for, as each year passes. From experience, I can confirm that a lot of vintage R/C items out there are being bought by people who build and/or play with them immediately. 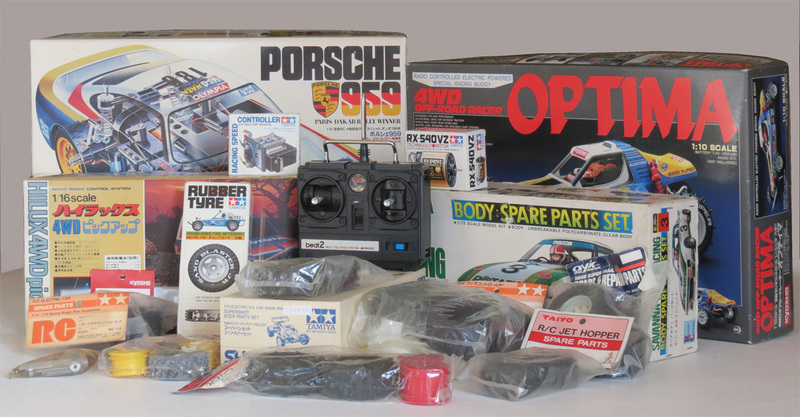 You might assume that such luxuries as “new in box vintage R/C kits” are only bought by collectors, to put on shelves. And yes there are plenty of collectors who collect and preserve. But there are just as many people who buy them purely to enjoy the experience of building and running them. And so they should. They’re toys to be enjoyed. So I’m humbly mentioning the fact that if you plan to buy some vintage R/C item or other, you should probably think about doing it ASAP. He who hesitates, finishes last. We might also look to other vintage toy hobbies with a longer history than R/C cars, to see what things might be like for R/C in future years. Consider vintage model trains. Examples from the 1950s or 60s still come up on eBay. But if you look around, most of what you see are used items. A few things are boxed. But how many are new in the box? Not that many. In 10-20 years from now, how many new in box, or new-built/mint condition examples will be available of any vintage R/C car? I suspect only a small fraction of what’s currently out there today. And sure, when other collectors grow old and pass away, some of those collections and items do come back on the market too. But those kinds of events are always sporadic and limited. It’s really never the same as grabbing stuff while you still can – while there’s still a trickle of top-condition examples coming up on a reasonably regular basis. Back in 2010, the Australian TV show called Collectors aired a segment about this plastic model kit collector, who had squirrelled away hundreds of great vintage items into what looked like a really cool man-cave. Perhaps we should all think like squirrels, storing nuts for the winter. Your retirement years should (hopefully) offer you some extra time for your hobbies, and end up being some really great years for messing about with R/C. Perhaps in a cool man-cave where you have space to both display and work on your cars. Much like a lot of the older model train and slot car collectors are doing today. So it might be worth thinking about stocking up on any cars and parts you might want or need later in life – to make sure you aren’t waiting forever to find them once they become harder to find one day. Think of all the building, running, restoring or kit curating you might be doing. Plan for your man-caves, gentlemen! Footnote: While “vintage” might rightly be considered a term relative to a person’s age or experience, the use of it here refers to R/C items manufactured prior to about 1995. This was the era of initial widespread popularity of R/C cars, when they were both highly innovative and were usually manufactured by brands within their country of origin (i.e. not China). As such, it is broadly considered a golden era of R/C cars. Good article. I still enjoy searching for new old stock and not just rc. I love nothing more than finding items from companies that may not even exist anymore, are of superior quality, made in a western country and are being sold cheap online. It’s a lot of fun isn’t it. And I agree about companies that no longer exist, and particularly about quality items from companies in western countries (especially since almost nothing is made outside China these days). Collecting vintage R/C is in some ways like an archaeological dig – sometimes you even find things you never even knew existed! I think one challenger from here on in, would be counterfeits, fakes etc. We’ve seen it with Star Wars. As for other places to get a bargain – you’d be surprised what you can get on local Facebook buy/sell groups. I picked up a nice 90’s RC buggy in mint condition for $20, sold for $50! Plus there’s also garage sales. But for the dedicated, there’s (in Brisbane at least) kerbside cleanup. The amount of general stuff I’ve found is insane, but you just never know who is throwing out old broken “toys”, and it may simply need repair. I agree it’s harder, but some different avenues open up a lot. Very true also, and I have no doubt weeding out counterfeits is going to become an art as the years go by. Fortunately, whole R/C cars still present a lot of counterfeit challenges, where unfortunately the much smaller/simpler action figures like the valuable Star Wars 12-backs and their accessories are a little more prone to it. Great to hear there are still some bargains to be found out there too, through physical channels. I actually picked up some leftover vintage R/C parts at a hobby shop in Adelaide a few weeks ago. And I agree that these avenues can open up – I think the hikes in eBay fees over the years (since it began) have driven a lot of people back to alternative options, so we should never rule out the possibility of stumbling upon things in all kinds of ways. Yes, things like this do happen!! Great aritcle ! Especially about “Man Cave”…years to work on ! Just fell upon your excellent website as an older but relatively recent fan of vintage RC. I had a Tamiya Fox and Kyosho Progress just for fun in the early 80’s, but now rekindling my interest as retirement approaches. Loved the article and your insight to the time-frame of the hobby and its relationship with eBay. As you say eBay has changed a lot since I joined in 2003. I have only been back into the RC scene for about a year but I’m already forming the man-cave with a view to the future having picked up a couple a vintage buggies (Associated RC10 and Kyosho Optima) to refurb and play with, plus a new Tamiya Unimog to modify towards a crawler-type machine. Such a great hobby for the future I think and you are perfectly right that there is no time like the present to start stocking-up. I am also delighted by the return of older models in their remade form as I am fan mostly of the technology, design and aesthetic rather than the sort of conservation-at-whatever-cost level of collecting. I already have a Classic RC10 and hope to shortly aquire the new Kyosho Turbo Scorpion. Here in the UK I have found Gumtree turning up the occasional bargain for thosse that are interested. This was a great post. I got here looking for slot cars, but I am also interested in RC. When are you going to do more articles on this blog? I enjoy reading about old RC stuff. Speaking of old RC, I saw this the other day. Worth a watch.